Oct 13, 2015 - Rabbi Yeshayahu Krishevsky, 59, of Jerusalem was killed when a terrorist rammed his car into a bus stop on Malkhei Yisrael Street in Makor Baruch, a religious neighborhood in Jerusalem, also wounding several pedestrians. The terrorist then left the vehicle and stabbed passersby. Rabbi Yeshayahu Krishevsky, a member of the Pinsk-Karlin Hassidic community in Jerusalem, was known for his profound scholarship. He was returning from morning prayers at "Beit Yisrael", standing at the bus stop on Malkhei Yisrael Street with the bag containing his prayer shawl and phylacteries, when he was killed. In recent years, Krishevsky lived alone. Out of devotion to the fulfillment of the commandment of the "brit mila" (ritual circumcision), he would make an effort to attend many of these ceremonies - boasting that one day he attended nine. It is said that he would never pronounce a blessing without someone present to respond "amen". Krishevsky was the author of "Peninei Yehoshua" - a series of books of commentaries on the weekly portions of the Bible. 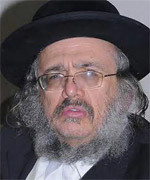 Rabbi Yeshayahu Krishevsky will be buried in the Givat Shaul cemetery in Jerusalem. He is survived by his son, Shneor Zalman, and grandchildren.